Form 7004 is the form used to file for an automatic extension of time to file your business tax return for a partnership, a multiple member LLC filing as a partnership, a corporation, or s-corporation. You must file this extension by the due date of your business tax return. This is an automatic extension, so you don't have to worry about your extension being approved. The IRS says, "Form 7004 does not extend the time for payment of tax." You must pay taxes due (estimated) by your tax return due date, even if you file an extension application. You will need to estimate as best you can because under-estimating can subject your business to fines and penalties. The due date for filing extensions on any federal income tax return is the due date of the tax return. Tax return due dates may change each year. If the due date is on a weekend or holiday, the actual due date for that year is on the next business day. Here is an article detailing the business tax return due dates for the current tax year. Extension applications for all business taxes must be filed by the tax return due date, taxes due must be estimated, and taxes must be paid by the due date, even if an extension application is being filed. The balance of any taxes due must be paid at the time the return is filed. Extension Application Due Date: Corporation tax returns are due and taxes are payable on the 15th day of the fourth month after the end of the company's fiscal (financial) year (effective with 2016 tax returns), on Form 1120. So, a corporation with a year-end date of December 31 must file and pay taxes by April 15. This is also the date when the extension application must be submitted. Deadline for Submitting Extended Return: Corporations have six months from the extension application due date to file the tax return. So, a corporation would have until October 15 to file the partnership tax return. Extension Application Due Date: The due date for partnership and multiple-member LLC tax returns on Form 1065 is the 15th day of the third month after the end of your partnership's fiscal (financial) year. For a December 31 year-end, the due date is March 15. (The old due date, prior to 2016, was April 15.) This is also the date on which the extension must be filed. Extended Return Due Date: Partnerships and multiple-member LLC's have six months from the extension due date to file the tax return. So, a partnership would have until September 15 to file the partnership tax return. 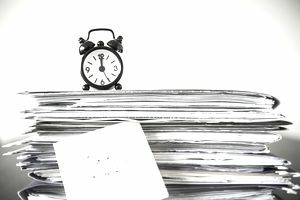 Extension Application Due Date: S corporations must take a December 31 year-end to coincide with the tax return due date of the owners, so S corporation tax returns are due March 15, filed on Form 1120-S. This is also the date when the extension must be filed. Include the name and address and Tax ID number (usually the employer ID number) for your business. If the extension application is for an S corporation (Form 1120-S), you would enter Code 25. If the extension application is for a partnership or multiple member LLC (Form 1065), enter Code 09. If the extension application is for a corporation (Form 1120), enter Code 12. The form asks if your business qualifies under Regulations section 1.6081-5,.This section related to foreign corporations, domestic corporations that transact business and keep books outside the U.S., or domestic corporations whose principal income comes from U. S. possessions. Indicate if this is a short tax year, and check the box for the reason for the short year. Show the tentative total tax. This is the amount of tax due for the business for that year. Even though you don't have your return done, you will need to do some calculations to get this number. Show the total payments and any credits applied to your account, and subtract this number from the tentative total tax. Finally, show the balance due. You can pay by debit or credit card (use your business account. You can file Form 7004 in two ways: (a) by mail, or (b) by e-filing. The IRS has a chart showing where to file Form 7004, depending on the tax return being filed and the location of your business. If you don't have a tax preparer filing your return, the IRS suggests that you use the Modernized E-File system to e-file your extension application. This system allows you to choose a provider from a list. You can also file your business tax return extension application online using your tax return preparation software, or your tax preparer can file online for you.